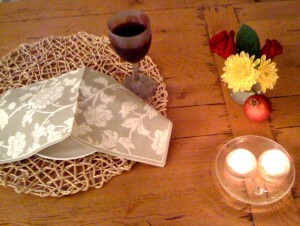 SHABBAT – How to Begin to Celebrate? If possible find Jewish friends who already celebrate Shabbat and ask to join them or, if there is a Jewish synagogue and community in your area, approach the Rabbi and share that you would like to learn more about Shabbat and join in a Friday night (Erev Shabbat) family meal. The Erev Shabbat meal experience offers the participation of all the senses – sight, hearing, touch, smell and taste – and one echoes this delight with songs from the heart in praise of the One who is the Source and the reason for it all. This “jumping in” presupposes a warm gathering of friends and/or family in a well prepared and familiar Shabbat setting, including a meal complete with the singing of special Sabbath songs (called zemirot). If you don’t know the words, you can la,la,la or da, da, dai, dai along with everyone else! Shabbat is a time to remember that our life is from Him, and in Him, and the desire of our hearts is to express our love and gratitude to Him. It is indeed a blessing if one is able to participate in a true, joyous and God- honoring Shabbat table gathering. However, if that is not possible, as a beloved child of God in Messiah Yeshua, you can create your own. All that you do, no matter how simple, in honor of the Lord and His Word will be blessed in return with the peace and beauty of His Presence, and you will enjoy the beauty and Shalom of the Sabbath as you rest in the Sar Shalom, the Prince of Peace. I would appreciate any suggestions you may have about keeping the Sabbath. No one [in my family or fellow congregants] seems to have caught my enthusiasm for learning about the Jewish roots of our faith. From reading with you through Leviticus and Deuteronomy, I have a growing sense of urgency about remembering the Sabbath and keeping it holy, but I don’t know what I should do! I crave that Sabbath rest. How do I find peace and holiness when e.g. my family only wants to watch TV! Thank you for your encouragement. My answer may help to address similar challenges that are being faced. 1. Our faithful and gracious Father knows the desires of your heart and will, albeit seemingly very slowly, guide you along the way. Rest and trust in Him. Your longing to honor the Sabbath in itself is pleasing to Him, as is any loving attempt on our part to honor and obey His Word. The Sages of Israel encouragingly affirm that God sees the honest and genuine intentions of the heart and accepts them as if one had already accomplished them. He knows our limitations and every small gesture is extremely precious in His sight. * Think of little things that will make the day special; for example, fresh flowers for Friday night, a sit-down family meal; if you bake try making challah bread (recipe below) or a special dessert. * After offering a simple explanation and emphasizing that this is something you want to do for yourself, light the candles on Friday evening. It’s lovely to have special candlesticks but even two little tea- lights will do. * Make time for Torah study – in particular the portion for the week (e.g. ‘A Taste of Torah’ or ‘A Dash of Drash’ available by e-mailing a request to his-israel.com@gmail.com; also see Suggested Resources below, or Jewish websites such as Aish.com and Chabad). As you plan your Shabbat this way, including relaxing & watching TV with your family (try to suggest a program or good movie more fitting to the spirit of the day! ), you will find that it will help to create the unique Shabbat atmosphere – which, with the Lord’s help, will be a blessing upon your family whether or not they are consciously aware of it. Please be encouraged and persevere. You are on the right track! Every little step counts! In a simple and beautiful way, the two Shabbat candles remind us of the lights of the Menorah, God’s Word of Truth, and the Living Word, Yeshua the Light of the world. The radiance that connects the two resembles God’s Shekinah – the Spirit of Holiness – that joins us together as one, reconciled in relationship with the Father and with one another. Thus, in His light, we experience the sanctuary of His Shalom, His peace. 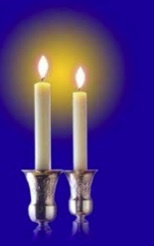 Baruch atah Adonai Eloheinu, melech ha’olam, asher kid’shanu be’mitzvotav ve’tzivanu lehadlik ner shel Shabbat. Blessed are You O Lord, King of the universe, Who has sanctified us with Your commandments and has commanded us to light the lights of Shabbat. Baruch atah Adonai Eloheinu, melech ha’olam, asher kid’shanu be’Toratcha ve’natan lanu et Ohr ha’Chaim b’Yeshua Mishicheinu Sar ha’Shalom. Blessed are You O Lord, King of the universe, Who has sanctified us with Your Torah and has given us the Light of Life in Yeshua our Messiah, the Prince of Peace. 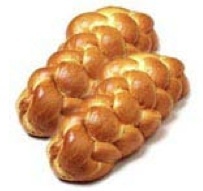 Special festive foods, such as the beautiful braided challah bread of Shabbat, are a central element of Jewish celebration and worship. 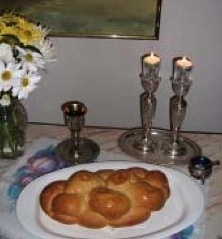 The importance of challah is highlighted in Midrash Rabba (Leviticus/Vayikra 15:6), where it is written: “One who keeps the mitzvah of challah is counted as though he has abolished idolatry.” A renowned Hassidic Rabbi, the Sfat Emet, commented: “Even bread has something within it that comes from on High.” Even a humble loaf of bread can connect us with our Source, our God, the Creator of all. And the first of your dough [challah] you should give to the kohen, in order that blessing will rest on your home (Ezekiel 44:30). 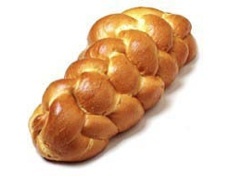 The Hebrew word challah [the ch is pronounced as in Bach] originally referred to the portion of dough set aside as an offering for the kohen (priest) at the Temple. Since the destruction of the Second Temple the word has come to mean the festive Shabbat bread itself. Bread is a staple food the world over and is an important element in the biblical narrative. Yeshua taught us to pray, “Give us this day our daily bread” (Luke 11:3). After the reminder, “It is my Father who gives you the true bread from heaven. For the bread of God is that which comes down from heaven and gives life to the world”(John 6:32-33), Yeshua made the astonishing claim: “I am the bread of life. Whoever comes to me will never be hungry, and whoever believes in me will never be thirsty” (6:35). The shape of the challah loaf always reminds me of the “babe wrapped in swaddling clothes,” born to the glorious song of angels under the special star that pointed to the new-born King! Baruch atah Adonai, Eloheinu melech ha’olam, ham’otzi lechem min ha’aretz. Amen. Blessed are You, O Lord our God, sovereign of the world, who brings forth bread from the earth. Amen. In Hebraic understanding a person is seen as a whole being. Both the body and the soul of a person are gifts from a loving Father and need to be appreciated and nurtured. In similar fashion, dough needs a mixture of both water (which can represent the spirit) and flour (the body). The prepared dough thus becomes a symbol of oneself and is lifted and set apart unto God when a blessing is said and a portion (the challah) is separated as an offering to Him. “In Your Presence is fullness of joy” (Psalm 16:11). After the rush of the week and the anticipation and preparation for the entrance of Shabbat on Friday evening (Erev Shabbat), the candles are lit, the challot are covered and on the table, the Kiddush cup is lifted and the Shabbat meal begins! “…So the heavens and the earth were finished” and we turn our minds to our Creator. “He made us holy, favored us; gave us His holy Shabbat marking the exodus from Egypt”. He does it all. He sanctifies us, redeems us, delivers us from evil. His is the power and the kingdom and the glory! Amen. Our hearts are filled with joyous gratitude to know that our Father, God, loves us and created the world for our benefit. Baruch atah Adonai Melech ha’Olam , Borei pri ha’gaffen. Blessed are You, O Lord our God, Creator of the vine. The cup of wine is a symbol of joy. We have met with our God on His appointed, holy and set apart day and we rejoice in His loving Presence. 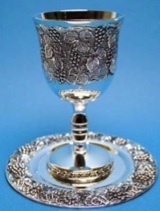 After the leader drinks from the cup, it can be passed around for everyone to sip from, as a sign of unity in our joy, or each one can have an individual glass in which the wine or grape juice has been pre-poured. As we share the bread and the wine on the holy day of Shabbat we rejoice in the Lord of the Sabbath and celebrate, with all our heart, mind and strength, the new life we have in Him. 1. Set aside a practice time of at least four hours for a first-time trial run. The steps will be: dough-making, shaping, rising, baking, cooling, bagging and freezing. Each step is important. 2. Practice the braiding technique with Play-dough, or strips of paper, ribbon or fabric, before you actually make the real dough. 3. Cover the raw challahs, once shaped, with plastic while they are rising. This prevents them from drying out and helps them rise. 4. Roll out each piece of dough with a rolling pin and then roll up each strand by hand ready to braid, ensuring the strands are the same length. 5. Use parchment baking paper on the baking tray/s, NOT waxed paper as this smokes when heated. 6. For a shiny look, brush raw challahs with beaten egg, using a brush with real hair so as not to damage the surface of the bread. 7. Last, but not least, say a prayer for success, asking God to bless your efforts. Also remember that perfecting a challah technique takes time and the more you try the more you will improve until you produce the perfect challah! Mix together 2 1⁄2 cups flour with the sugar, salt, dry yeast, water and oil. Mix in 4 eggs. Beat in 11⁄2 cups flour very well. Add 4 – 5 cups flour until a very soft dough is formed. Add raisins. Knead. (Separate portion of challah if necessary.) Refrigerate overnight. In the morning let warm to room temperature, 1-2 hours. Make balls, roll them into ropes and braid. Let rise, covered [with plastic] for 1⁄2 – 1 hour. Beat 1 egg to make egg wash. Brush on challah. Bake in oven pre-heated to 325 degrees F. (175 deg.C. ), for 30-45 minutes. Breathe in the special Shabbat aroma and may it be a blessing! 1. Lori Palatnik, Friday Night and Beyond, Jason Aronson Inc, New Jersey, 1994, 121. This book is a wonderful reference and step-by-step handbook on Shabbat, with blessings, recipes, and more! 2. There are Scripture-based and meaningful prayers recorded in the Siddur (Jewish Prayer Book) that you can happily base your prayers upon. 4. Families usually have two challot on the Shabbat table Friday night to remember God’s instruction that the Israelites collect a double portion of manna on Fridays, in order that they not go out to gather any on Shabbat. Baruch atah Adonai, ELoheiny melech ha’olam, asher kidshanu b’mitzvotav ve’tzivanu le’hafrish challah min ha’isah. Blessed are You, O Lord our God, King of the universe, Who has sanctified us with His commandments and commanded us to separate challah from the dough. This entry was posted in The Sabbath by Cindy Lou. Bookmark the permalink.